Posted on Fri, Nov 25, 2011 : 9:08 a.m. The new dinnerFeed site has just been launched! Click here for a collection of well-tested recipes — dozens perfect for holiday entertaining. A "Print-Recipe Only" function and speedy search engines make finding recipes a cinch! Nothing goes to waste in my kitchen — particularly a meaty carcass, which provides a wonderful base for soup. I make this soup at this time every year. This freeform recipe uses whatever leftovers you may have from yesterday's meal. Mashed potatoes are particularly wonderful as they thicken the broth. 1. Remove all usable turkey meat from turkey carcass. Chop and reserve meat with leftover turkey. 2. Place carcass, skin and juices into a large stock pot and completely cover with water to exceed carcass by 1-2 inches. 3. Place yellow onion, carrots, celery tops, peppercorns, herbs and bay leaf, if desired, into pot. Bring to a boil then reduce heat to a simmer, skimming off any foam accumulating on the surface of stock. 4. Simmer until flavorful, about 4 hours, uncovered, occasionally skimming off foam. 5. 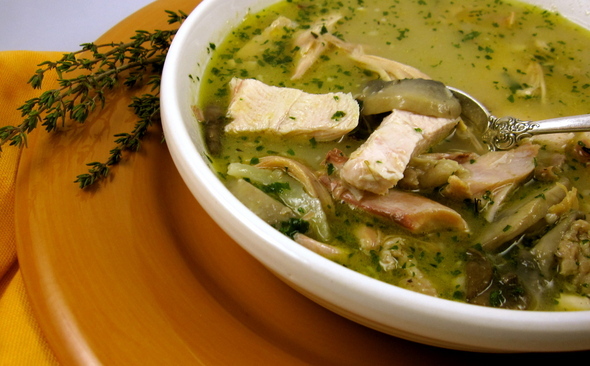 Add leftover turkey and additional leftovers to the stock, reheat and serve. My new web site (packed with holiday recipes) is up (www.dinnerFeed.com)! I'm a real-time food writer and photographer posting daily feeds on my website and in the Food & Drink section of Annarbor.com. You may also e-mail me at peggy@dinnerfeed.com. Tue, Nov 29, 2011 : 1:29 a.m.
Peggy, nice suggestion for the left overs. Will definitely try your recipe. And check out your new site.